We already studied common French verbs followed by the prepositions ‘à’ and “de”. Now, here is a list of common French verbs which are not followed by any preposition when followed by a verb in the infinitive. The second verbs comes directly after the first verb, as in “Paul adore jouer au foot” (Paul loves to play soccer). These verbs may or may not take a preposition in English: to avoid mistakes, don’t translate! 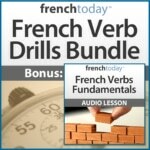 Link the French verb construction to the image of action being described, not to the English words. To make it clearer, I’ll use “faire quelque chose” as my second verb, but you could replace it by any other infinitive that makes sense. Example: descendre faire la cuisine = to go downstairs to cook. Read more about these verbs here and when to use être or avoir with them. If you know more COMMON French verbs followed by no preposition + verb in the infinitive, kindly leave a comment below, and I’ll add them to the list. Merci!